Say “sweet” and onions are usually the last food that comes to anyone’s mind. But once they’re cooked up, they really do have a nice sweetness to them, and the taste goes really well with the sweet potatoes and the savory homemade chicken stock. If your holiday menu typically includes sweet potatoes but you want to switch it up a little, this would be an interesting alternative to mashed/roasted/candied preparations, but it’s also easy enough to make just for dinner, without any particular occasion. This would make a very easy soup to make in bulk now (minus the garnishes) and freeze for a busy week during the holiday season when salad just isn’t cutting it as a side dish. Wouldn’t it be nice to have something all ready in the freezer and just needing a quick defrost? 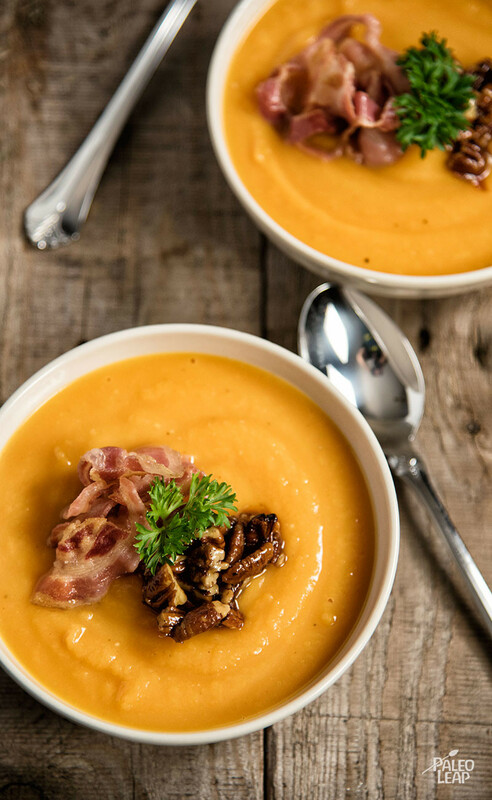 If you serve this soup without the garnishes, it’s a basic-but-tasty pureed sweet potato soup. 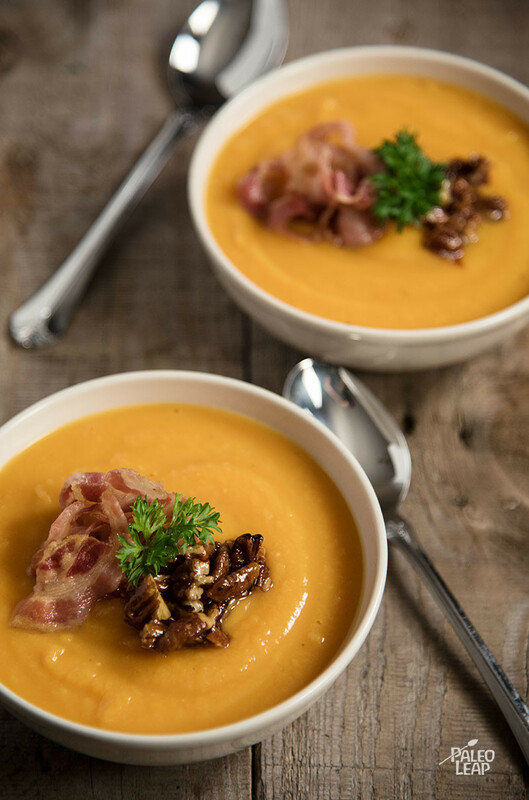 But if you want something special on top, the optional pancetta and pecans make a crunchy-salty topping that really brings out the other flavors. In a large saucepan, melt the coconut oil over medium-high heat. Add the sweet potatoes and cook for about 4 minutes. Pour in the broth. Bring to a boil; then lower heat, simmer, covered, for about 20 minutes or until the potatoes are tender. In a blender or using an immersion blender, purée the soup until smooth. Sprinkle the soup with cinnamon, and season to taste. Serve immediately in bowls topped with pancetta, roasted pecans, and fresh parsley.